Back in May I argued that we should be talking about improving surface transit even for avenues with subways or els, for three reasons. First, it can help calm speeding personal cars and trucks. Second, it can provide local hop-on, hop-off service, which is especially valuable to people who have difficulty walking or climbing stairs. Third, especially with New York’s high construction costs and deference to NIMBYs, it can accommodate increases in demand in much less time than building a subway or el. 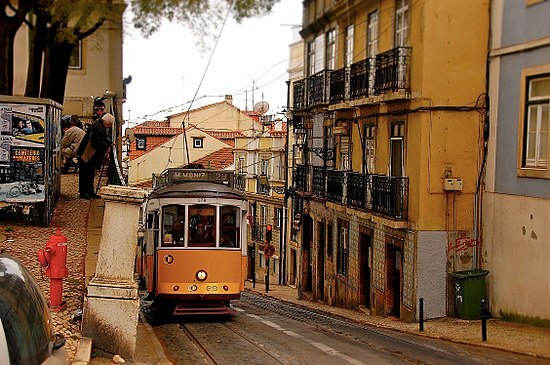 A couple of weeks ago Sandy Johnston tweeted a great picture from Lisbon to illustrate that street-level transit does not need huge boulevards; the minimum width is not much more than the width of the vehicle. Of course, for it to be rapid transit the route has to be unimpeded by private vehicles, but we could never get a useful network if we only built transitways on our widest boulevards. The city does have an extensive network of hundred foot avenues, and we can have a decent surface-level rapid transit network once we find reliable ways of making transit rapid within a hundred feet. So what arrangement of road space would do the most to discourage single-occupant driving while still allowing people to get to work and shopping, and to receive and ship things? I’ll talk in future posts about what has worked in the past and what might work in the future, but today I need to talk about a couple of things that don’t work. The Department of Transportation originally proposed banning vehicles other than transit on Thirty-Fourth Street. That can work; I’ve seen it work on Fulton Street in Brooklyn and yes, on State Street in Chicago. But it only works if businesses can still receive deliveries. I’m not sure what they do in Brooklyn, but I know in Chicago they have alleys. I’ve read promising things about deliveries by trolley and bicycle, but until those are closer let’s plan for some private vehicles, especially on wider avenues. The Department of Transportation has tried reserving the entire curbside lane for buses on avenues like Second Avenue and 34th Street, with unsatisfying results. To begin with there’s always a major outcry from residents and business owners, who are used to having the curbside lane for turning, unloading and customer parking - and more often than not, parking for residents and business owners. The city has compromised on this issue in a very counterproductive way, by suspending the bus lanes to allow private loading and even parking during middays, nights and weekends, and allowing turning and passenger dropoffs at all times. But they still painted the lane red, teaching drivers that the lanes don’t really matter and making things harder for an already uninterested NYPD. I’m not entirely sympathetic: it’s been shown that for businesses in walkable neighborhoods in New York, the majority of customers arrive on foot, by bus or by train. The guy who gets his Goya beans delivered to his apartment on 34th Street can have them wheeled around the corner on a handtruck. But as I wrote a few years ago, a lane for parking suits our goals better than a lane for moving cars. If we have a hundred feet to work with, minus sidewalk and transit lanes, I’d rather fill the rest of the space with a traffic lane and a parking/loading lane than two traffic lanes. Curbside bus lanes can work fairly well in places like the west side of Fifth Avenue where there are no businesses and relatively few turns - although even that lane would benefit from better enforcement. On avenues with businesses and intersections, it’s not the best approach. I’ll talk about other possibilities in future posts.